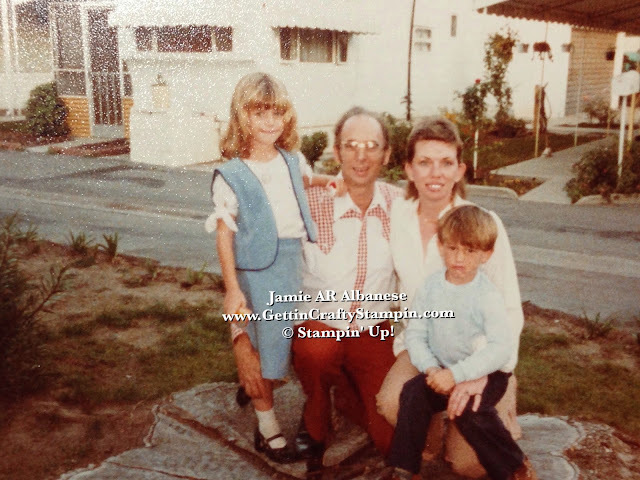 As Father's Day nears, my thoughts return to my own Daddy, I have to smile - I had a zany Dad. He was known for dancing around the house (the Twist!! ), making home made bread on our glass dining table while I laid under the table and watched the kneading processes, being a stellar chef, liking to joke and laugh.. now as he is looking down on me, I create this Father's Day card and it makes my Daddy come to mind and I smile. 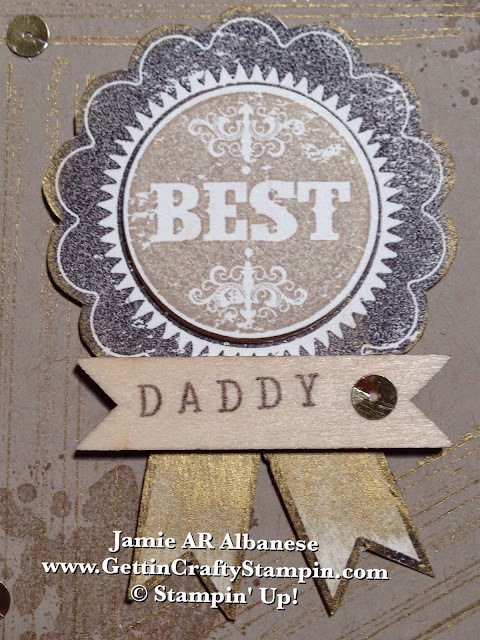 Create this Best Daddy ribbon when you stamp the ribbon base from the Blue Ribbon stamp set with Chocolate Chip ink on the Very Vanilla card stock. Rub the Gold Metallic Encore pad on the ribbons and around the edges of the Scalloped Circle. Stamp the 'Best' accent from the Blue Ribbon stamp set with Crumb Cake card stock. Use the 1-3/8" Circle Punch and punch out this element. Layer the Circle 'Best' over the center with a Stampin' Dimensional. The Color Coach aides my crafting when it partners colors for a good looking project. Here the Chocolate Chip is the Monochromatic 'sibling' to the Crumb Cake. One of my New Favorites from the New Catalog is the Alphabet Rotary Stamp!! Quickly create words and sayings that you can personalize and use in your crafting!! Here 'Daddy' with the Alphabet Rotary Stamp and using the Chocolate Chip ink on this banner from the Essentials Wooden Elements brings my own Daddy to mind. Stamp the Crumb Cake card stock card with the Gorgeous Grunge splatter with the Crumb Cake ink. Add a fun metallic accent with these lines and the Gold Metallic Encore Pad. I stamped it so that the lines were a subtle 'frame' for the ribbon. Accent the Wooden Banner and the card with the Sequin for a dash of masculine bling. OK so I think I'm around 7 or 8 in this picture!! It was a family gathering at my Great-Aunt Pauline's home. Looking back on memories is a great way to bring those who are gone back into your life. I do miss my Daddy... I'm sure he is looking and chuckling at my wacky life and busy family. I love my kids and seeing them have their own 'Daddy' moments with my husband. Being a Daddy's girl did me well in life and as Father's Day nears, this Best Daddy card would surely make my ol' Daddy smile. Create a personalized card with the new Alphabet Rotary Stamp set and show that you care! Were YOU a Daddy's kid? Leave me a comment with your favorite memory and I may pick YOU to send this card to!